This is my son Bryice. He is 2 years old. Each year I try to come up with a very original costume. This year we decided on a Box of Popcorn costume. I started early on the creation so I would have plenty of time to make it just right or pick a new idea. We are both very happy with the result. -use your red market draw stripes on all 4 sides. – to make the popcorn-Crinkle white paper up in different shapes spray with Great Stuff let dry. – use 2 pages of white computer paper, Crinkle it up in a bowl shape. Spray Great Stuff on the rounded side. let dry. – Remove tape on the inside of bowl and slide hardened mold from bowl. – Poke holes threw 2 sides to attach the rope for a handle. I looked at the great stuff at Lowe’s today and it is flammable.. I don’t think I will be using that on my child’s costume..
….so is fabric. she made a wonderful costume, don’t come up in here and try raining on the parade. I’d like to see you do better…did you buy a costume at Lowe’s while you were there? My daughter will be a box of popcorn for a dance recital. 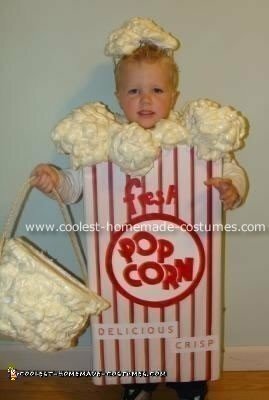 We ordered the box part of the costume, but I needed an idea for how to make the popcorn! Thanks! Never heard of “Great Stuff” but will look for it.